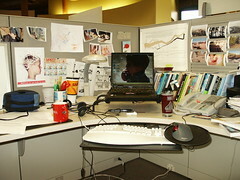 A list of ergonomic office equipment for practical applications of ergonomics in the workplace. Laptops are not ergonomic. Period. They are not recommended for long time use - i.e. more than two hours a day. The use of laptop computers SHOULD NOT be full replacements of desktops. Doing so will pose long term threats to health. However, in our increasingly mobile society, one can still use laptops in an ergonomic way such as installing a laptop docking station. The laptop screen should be raised to eye level, and a mouse and keyboard should be plugged in for use. To understand the full brunt of it, please read Laptop Ergonomics. Another very important piece of ergonomic office equipment besides the chair and the keyboard is the ergonomic mouse. Placement of the mouse is as important as the importance of an ergonomic mouse, one that fits your hand and the way you use it. Make sure you are sitting high enough to be slightly below elbow height so that your hand naturally rests on the mouse. Preferably, use a footrest that is height adjustable. Especially if your knees do not make a right angle when you are sitting in your chair. See Ergonomic Chair Adjustment for more information on how to use a footrest correctly. See also our recommended ergonomic foot rest. Ergonomic keyboard arms are specifically designed support extensions used for holding the computer's keyboard. It is a movable piece allowing the user to maintain a neutral position when using keyboard to prevent carpal tunnel. Keyboard arms help prevent injuries to tendons and back muscles which are caused by repetitively typing. Unlike keyboard trays, keyboard arms are not fixed and can be adjusted to left or right, up or down. Keyboard arms help in reducing the strain and fatigue. Is your monitor ergonomic? It should not be too glaring and it should be aligned with your natural line of sight, when you are sitting upright at your computer. Monitor Ergonomics states that everyone should personalize their monitor's height because simply, every one is different, with different heights and torso lengths. If more than one is using that workstation, installing ergonomic monitor stand/arms is a good choice. Monitor arms are also called the 'swing arms' or the 'swivel arms'. Monitor arms allow placing the monitor on a platform which is attached to the adjustable arm. You can easily position the monitor either directly in front of you or to the side when it is not in use. Moreover, monitor arms facilitate in providing more desk space. Ergonomic keyboard trays are adjustable devices which you can attach to your computer desk. It holds the keyboard and even the mouse. You can adjust the keyboard tray according to your needs. While typing, if you have to raise or extend your arms then it will put continuous strain and cause injury. If your upper arms are not hanging straight down from the shoulders then you are putting strain on your shoulders and neck. Moreover, leaning forward and tilting the wrists and forearms when typing will also put strain on your body. These can be prevented if you use keyboard trays. These ergonomic computer equipment will allow you to maintain the correct posture thus minimizing the chances of an injury. See our recommendation: best selling ergonomic keyboard trays. Ergonomic keyboards are one of the most popular piece of ergonomic office equipment after the chair. This is because they help align our wrists to be in neutral position, preventing sore wrists and carpal tunnel injuries. However, while the use of ergonomic computer keyboards lowers the risk of computer injury, the way we type and our hand posture is the other half of the battle. See also Typing ergonomics. See the variety of ergonomic keyboards here. Ergonomic document holders are very efficient ergonomic office equipment for holding the document while you are typing. Moreover they reduce the clutter on your desk. If a document holder is not used, you would be placing the document in such a way that maintaining a correct posture would be not easy; it would lead to a reduction in your productivity. You would be putting strain on your eyes, neck and shoulders. By using an ergonomic document holder, the staring would be reduced and you would feel comfortable while working. You can remove the document holder when it is not in use. See where to buy computer document holder . You can use a chair lumbar support on your chair for maintaining better ergonomics. By using a chair lumbar support, there would be minimum back muscle activity. When we put our thighs in a horizontal position, the lumbar curve of our lower back flattens thus forcing our back muscles to support the weight of our upper body. This results in putting an unnecessary load on our spine thus causing pain and fatigue. If we use an ergonomic chair lumbar support, the natural curve of our back gets support and thus reduces the risks of injuries and gives a relief to the spine. See also How to buy Ergonomic Back Supports. how to buy a good ergonomic chair. The variety of ergonomic computer chairs. Workstation Ergonomics establishes that standard workstations cannot accommodate everyone's needs. Adjustable workstations and ergonomic equipment may be needed in situations when there are more than one person using the same work station. Some quick ergonomic work stations tips. Ses OSHA.GOV for more ergonomic workstation suggestions. Thank you for reading 'Ergonomic Office Equipment'! Go back to Workstations Ergonomics.